Alex Rins topped the timesheets as no less than 14 Moto3™ riders were caught out by greasy conditions at Assen on Friday morning. The Estrella Galicia 0,0 rider led the way from Team Calvo’s Maverick Viñales and his own teammate Alex Marquez. The result means three different riders have topped as many Moto3 sessions so far this race weekend. Following two chiefly dry periods on Thursday, the field was tested by an extremely greasy track surface at historic Assen this morning. As conditions improved in the final minutes, Rins reduced the leading lap time to 1’56.783, while championship leader Luis Salom (Red Bull KTM Ajo) finished fourth. The following 14 riders all suffered falls: Livio Loi, Niklas Ajo, Thomas van Leeuwen, Efren Vazquez, Alan Techer, Zulfahmi Khairuddin, Isaac Viñales, Jack Miller, Jasper Iwema, Francesco Bagnaia, Bryan Schouten, Philipp Oettl, Ana Carrasco and Eric Granado. 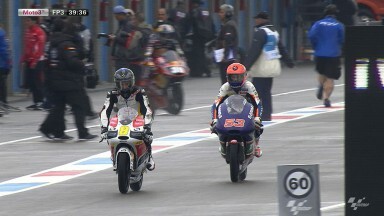 Moto3™ Qualifying begins at 12:35pm local time (GMT +2).